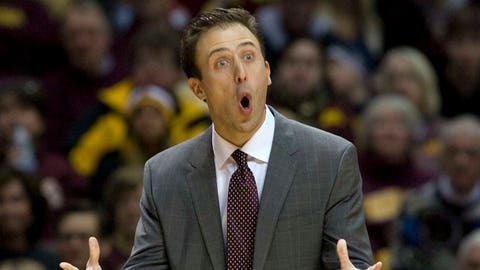 New coach Richard Pitino earned his first Big Ten victory in a nail-biter against Purdue. MINNEAPOLIS (AP) — Austin Hollins had 18 points and nine rebounds, and Minnesota went 23 for 27 from the free-throw line to hang on for an 82-79 victory over Purdue on Sunday, the first in the Big Ten for new coach Richard Pitino. Andre Hollins added 17 points and five assists and made 9 of his 11 foul shots for the Gophers (12-3, 1-1), who led by as many as 19 points in the second half before surviving a determined comeback. The Boilermakers (10-5, 0-2) grabbed 21 offensive rebounds to stay in the game, and after Malik Smith missed two free throws with 4 seconds left, Kendall Stephens had a half-court heave to tie it that fell well short. Stephens hit a 3-pointer right before that sequence from the top of the key to pull Purdue within three points. Terone Johnson had 18 points and Ronnie Johnson had 13 points for the Boilermakers, but A.J. Hammons lost the big-man battle with Elliott Eliason. The Gophers led 70-54 with 7:10 left, but Terone Johnson and Sterling Carter hit 3-pointers to bring Purdue within 76-72 with 2:16 remaining, the closest the Boilermakers came since the same mark in the first half. Until Smith’s misses, though, the Gophers sank six straight foul shots over the closing minutes to stay in front. With a subzero temperature outside and students still on winter break from classes, the crowd was a bit thinner than the usual conference-game gathering, but the Gophers provided plenty to cheer. Austin Hollins and Oto Osieneks sandwiched 3-pointers around a two-handed block by Eliason late in the first half, and Austin Hollins added another one before the break to push Minnesota’s lead to 42-35. Shortly after halftime, Austin Hollins found an opening on the baseline and soared to the rim for a tomahawk dunk that put the Gophers up by 10 points. The Boilermakers made five 3-pointers over the first 16 minutes of the game, but when they were able to drive through the zone they rarely looked for Hammons, who had 18 points plus a career-high 16 rebounds, five blocks and four assists on Tuesday against No. 3 Ohio State. Hammons attempted only two field goals and finished with seven points. For the Gophers to keep up in the top-heavy Big Ten, with Ohio State, Wisconsin and Michigan State all ranked this week in the top five of the Associated Press poll, this was one of those games they simply had to win. They slipped a little down the stretch, missing too many free throws, and dropped a 63-60 decision here three days ago when Michigan was missing stars Mitch McGary for the whole night and Glenn Robinson III for most of the second half. Up next for Minnesota is a trip to Penn State. But then comes a four-game meat grinder: at Michigan State, against Ohio State, at Iowa and against Wisconsin. The Gophers never finished with a winning conference record in six seasons under coach Tubby Smith, and this year won’t be any easier given the competition, but if they can continue to shoot like this from the outside they’ll have a good chance. The perimeter starts and ends with the Hollins boys, who aren’t brothers like Purdue’s Johnsons but have the same hometown in Memphis and have grown close enough over their time at Minnesota to become related. Andre Hollins was fouled on all but one of the jumpers he took in the first half, but he swished it from 3-point range. Austin Hollins made three from behind the arc before the intermission. The Hollinses combined for only 14 points against Michigan on Thursday. The Boilermakers brought a promising young core into this season after finishing 16-17 and missing the NCAA tournament for the first time in seven years, with three sophomores and a freshman in the starting lineup and three other freshmen part of the rotation off the bench. But coach Matt Painter’s attempt to restore the stifling defense his mentor Gene Keady instilled in this proud program has not been working. Purdue gave up the second-most points in the Big Ten last season and is second-to-last in scoring defense again, allowing an average of 71.3 points per game.